This villa on the estate was renovated in 2015 and can now be enjoyed as individual guest rooms with full ensuite bathrooms or as a 6 bedroom/6.5 bathroom private vacation house that accommodates up 20 guests. There are 3 kings, 4 queens, 2 doubles, and a pull out queen sofa bed. All the guest rooms are over 280' feet and have decks, locking doors, and private bathrooms. 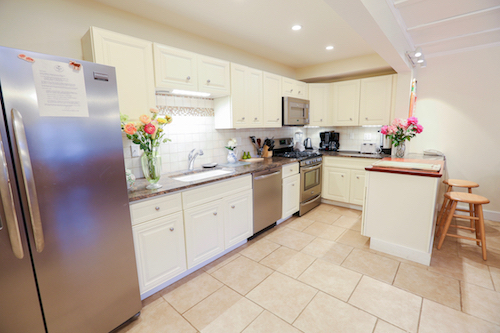 There is a brand new, spacious kitchen with dining space for up to 20 guests. Upstairs is a living room with leather couches and a flat screen TV. This is a wonderful house for corporate groups as well as family and friends celebrating family reunions, ski weekends, or week long vacations at the Vermont Summer Festival Horse Show. Room 30 is a spacious guest room with two wooden queen beds in our Strawberry Hill Villa. 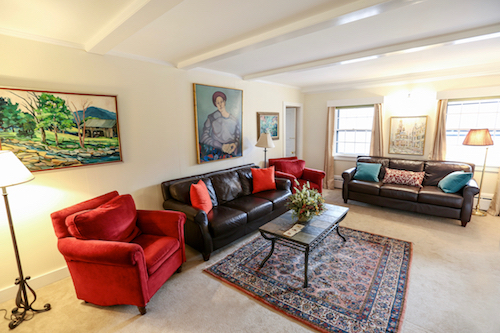 This ground floor room is easily accessible and offers great views of Mount Equinox. Large ensuite bathroom with a shower/tub. Free wifi, flat screen TV, window A/C, pets welcome. 280 square feet. Room 31 is a spacious guest room with two wooden queen beds in our Strawberry Hill Villa. This ground floor room is easily accessible and offers great views of Mount Equinox. Room 32 is a spacious king guest room with a high carved mahogany bed in our Strawberry Hill Villa. A deck off the guest room offers great views of Mount Equinox. Room 34 is a spacious guest room with two wooden double beds in our Strawberry Hill Villa. This guest room is great for families and has a deck with great views of Mount Equinox. Room 35 is a large king suite in our Strawberry Hill Villa that is ideal for families. This spacious king guest room has a sunny sitting room with a pull-out queen size sofa, mini fridge and flat screen TV. There's even a deck with sensational mountain views. Free wifi, flat screen TV, window A/C, pets welcome. 482 square feet. Room 36 is a sunny and large King bedroom in our Strawberry Hill Villa. This cheerful lavender room has a flat screen TV and a deck with sensational mountain views. Large ensuite bathroom with a shower/tub. Room 35 is a king suite across the hall with a king bedroom and pull out couch for groups that like to travel with friends or children. Free wifi, flat screen TV, window A/C, pets welcome. 300 square feet.